In a large bowl, stir together the corn, corn muffin mix, sour cream, and melted butter. Pour into a greased 9x13" casserole dish. 336 members have added this recipe to their cookbook. This was very good! My kids liked it as well. Quick and easy to make. I have made this in stoneware in the microwave during the summer and don't even have to turn on the oven. I also modify it by using Fat Free Sour Cream, low fat Mozarella instead of cheddar and 1/3 cup olive oil instead of butter. My whole family loves it! For an event at Curves, one of our members brought this and mmmmm mmmmm good. It went really fast!!!! While I would make some changes if I was making it for myself, (fat free sour cream, red fat cheese, light butter), this looks exactly like the recipe my cousin was trying to find to make on Thanksgiving, so I'm giving it to her!!! Good! I drained the corn too. This was yummy, yummy, yummy! I didn't have any butter, so I substituted canola oil and it turned out wonderful! I love this recipe. My family and I have done it at least 6 times already. Awesome. Remember that portion is key. You can have what you love in moderation. This is delicious, but hardly what I would consider eating on a diet! This was excellent!!!!! You can't imagine it, until you try it. I drained the whole kernel corn, because I wanted it to be like corn bread, and I left off the cheese. It was like a moist corn bread/pudding! 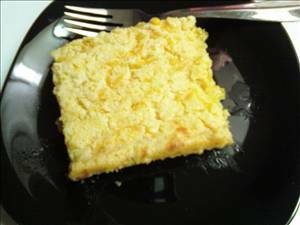 There are 255 calories in 1 serving of Corn Casserole. Calorie break-down: 58% fat, 33% carbs, 9% protein.